This tutorial will only apply if you are using the website version of the Charlotte theme. 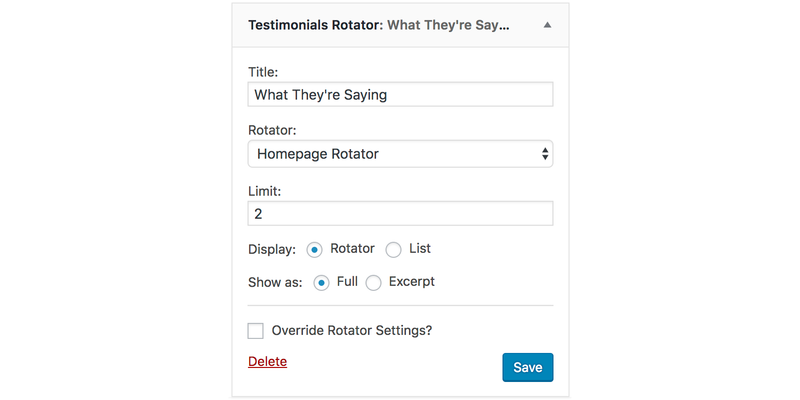 The blog version does not support the Testimonial Rotator plugin. Install and activate the Testimonial Rotator plugin. Once installed, a "Testimonials" tab will be added to your Wordpress dashboard. You're first going to set up the rotator before adding the actual testimonials. Go to Testimonials > Add Rotator. Give the rotator a name at the top of the page, like "Homepage Rotator" (no one will see this). Configure the settings as shown below, and then click Publish. Put the name in the top title box. Put your the testimonial/review in the main content box. Scroll down to the Testimonial Options section and select the name of the rotator you created above. Publish. Under Rotator, select the name of your rotator. Give the widget a title – in the demo, it's "What They're Saying." When you're done configuring the widget, hit Save.